Why are the answers in this FAQ so long? Socialism is almost globally misunderstood and misrepresented. Socialism will be a basic structural change to society, and many of the things that most people take for granted, as “just the way things have to be”, can and must be changed to establish socialism. People tend to accept as true the things they hear over and over again. But repetition doesn’t make things true. Because the truth and the facts often contradict “common knowledge”, socialists have to show that “common knowledge” is wrong. That takes more words than just accepting the status quo. What is the World Socialist Movement (WSM)? The World Socialist Movement is an organization which began with the founding of the Socialist Party of Great Britain in 1904. The Companion Parties of Socialism, which make up the World Socialist Movement, are those parties sharing an understanding of what socialism means, how to establish socialism, and a scientific analysis of past and current society. For more information about the WSM, see Introducing the World Socialist Movement on the World Socialist Movement web site. Why doesn’t the World Socialist Movement get involved in social activism? By “social activism” most people mean demonstrating, protesting, or otherwise attempting to influence immediate events in society, and still under capitalism. These attempts to reform capitalism have a very long history: as long as capitalism itself. We call these actions “reformism”. Organizations which claim to want socialism, and which also promote reforms, ignore socialism and spend their time working for reforms. The Companion Parties of Socialism, in the World Socialist Movement, are socialist parties. They promote socialism because that is all a socialist party can promote. If you find a “socialist” party promoting “social activism,” you’ll have found a non-socialist party. The World Socialist Movement doesn’t have a leader, and nor do any of the Companion Parties, because leadership is undemocratic. If there are leaders, there must be followers: people who just do what they are told. In the World Socialist Movement, every individual member has an equal say, and nobody tells the rest what to do. Decisions are made democratically by the whole membership, and by representatives or delegates. If the membership doesn’t like the decisions of those it elects, those administrators can be removed from office and their decisions overridden. Only when people have real, democratic control over their own lives will they have the freedom that is socialism. Isn’t socialism what they had in Russia, or in China or Cuba, or in Sweden? a system of society based upon the common ownership and democratic control of the means and instruments for producing and distributing wealth by and in the interest of society as a whole. If there are wages and salaries, it is not socialism. State ownership is not socialism. Social programs are not socialism. Socialism means democracy at all levels of society, including the workplace. Socialism means a wageless, moneyless society. Socialism means free access to the goods produced by society. 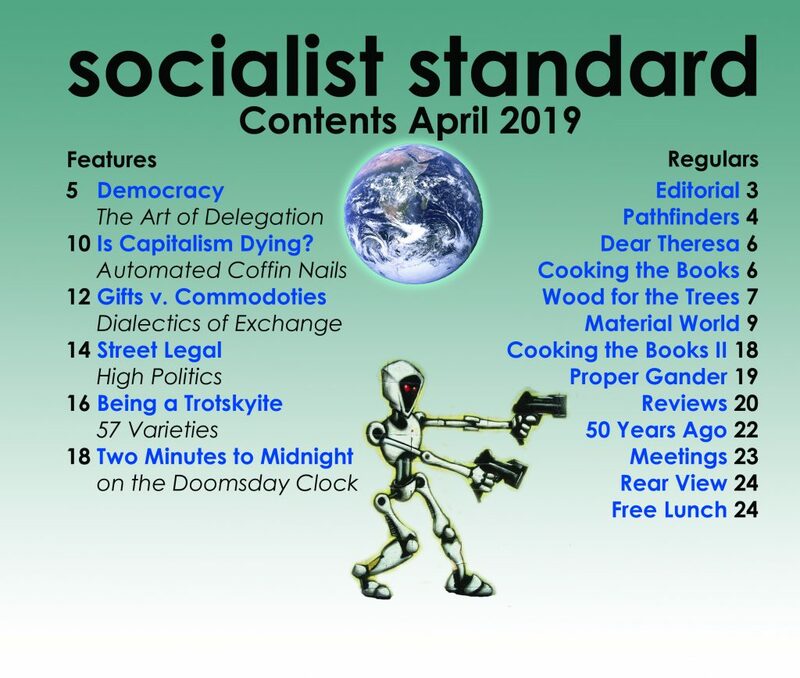 With this understanding of socialism, the Socialist Party of Great Britain noted in its journal, the Socialist Standard (August 1918, page 87), that the supposedly “Marxist” Russian Revolution of November 1917 was not socialist. Wouldn’t everyone have to be altruistic for socialism to work? No. Socialism isn’t based upon altruism. Socialism will work even if everyone suddenly decides that they dislike everyone else. Supporting socialism involves recognizing the fact that the current system just doesn’t work for most people. Socialism will be a society in which satisfying an individual’s self interest is the result of satisfying everyone’s needs. It is enlightened self-interest that will work for the majority. 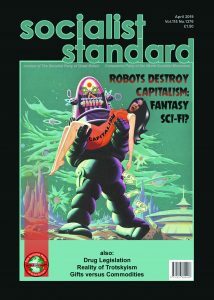 How will socialism be established? Socialism can only be established by a vast majority of people deciding it wants to establish socialism. Therefore, the World Socialist Movement puts forward the socialist case so that people can decide for themselves. Once the vast majority makes the decision in favour of socialism, then it will elect socialist representatives or delegates to prove its majority, and to serve as a temporary focal point to administer the elimination of capitalism and the creation of socialism. But it won’t be, and could not be, the elected representatives or delegates who create socialism, it will be the people of the world as a whole. The vast majority of the people of the world are working class, so socialism will be established by the working class. It also means that ordinary people will have to do all of the work required. The capitalist class isn’t going to do it, and professional socialists (whatever they might be) aren’t going to do it. The only way to establish socialism is for people to work for it. What if one country establishes socialism and others don’t? One country cannot establish socialism. No country is completely self-sufficient in the resources people need to satisfy their needs. No country can really isolate itself from the rest of the world in a peaceful manner, so a peaceful “socialist nation” would be easy prey for the outside capitalist world. Just as capitalism is a world system, socialism will have to be a world system. Socialism will be a world without countries. Borders are just artificial barriers that belong to a past and present that is best left behind. What will socialism be like, how will it be administered? The World Socialist Movement does not offer a blueprint for administering a socialist society. For a small group of socialists to do so would be undemocratic. It would also be dumb. Socialists don’t have crystal balls to determine what the conditions will be when socialism is established. As the socialist majority grows, when socialism is within the grasp of the working class, then will be the proper time for making such important decisions. The only thing socialists can say now, about administration, is that socialism is only socialism if it is democratic. The World Socialist Movement talks of a moneyless society; does that mean we’ll use the barter system? In a socialist society, there will be no money and no barter. Goods will be voluntarily produced, and services voluntarily supplied to meet people’s needs. People will freely take the things they need. Humans behave differently depending upon the conditions that they live in. Even very short term changes in those conditions can change the way people behave. Most of what people refer to as “human nature” is actually human behaviour: reactions to the world around them. Human behaviour reflects society. In a society such as capitalism, people’s needs are not met and reasonable people feel insecure. People tend to acquire and hoard goods because possession provides some security. People have a tendency to distrust others because the world is organized in such a dog-eat-dog manner. Under capitalism, and the previous systems, people have good reason to worry about tomorrow—they can lose their jobs, or be injured, or grow old, and need a cushion of wealth to fall back on. In a socialist society, everyone is entitled to have their needs met. They won’t be kicked out onto the street, or forced to give up the pleasures of life. There will be no poverty. The “cushion” will be cooperatively provided by all. But why will people work if they don’t have to? People will have to work, but it will be voluntary. If people didn’t work society would obviously fall apart. To establish socialism the vast majority must consciously decide that they want socialism and that they are prepared to work in socialist society. Work is part of human life. Today rich people work when they don’t have to, because they, like many of the rest of us, enjoy working. Many people work harder at their hobbies than they do at work. It is the nature of employment that makes it “work” instead of pleasure. Work needn’t be a part of the day that we wish would end. People enjoy creating useful things. Instead of producing junk that people only buy because they can’t afford quality, every worker will be able to produce quality products for themselves and others, and know that other workers will be doing the same. The workday will be shortened. Many jobs (such as those dealing with money, or war, or poverty) will not be required at all. The people doing those jobs now, will perform work that actually produces goods and services that people want. People will gain respect for doing jobs that others might find unpleasant, or the unpleasant jobs might be shared around. Many of the unpleasant jobs could be made more pleasant and some could be done away with. Does socialism mean equal shares for everyone? No. People are different and have different needs. Some needs will be more expensive (in terms of resources and labour needed to satisfy them) than others. What if people want too much? In a socialist society “too much” can only mean “more than is sustainably produced.” If people decide that they (individually and as a society) need to over-consume then socialism cannot possibly work. Under capitalism, there is a very large industry devoted to creating needs. It tells us we need toilet seat warmers, nifty gadgets (that don’t work), new this and that, and attempts to convince us that our human worth is dependent upon our material wealth. Capitalism requires consumption, whether it improves our lives or not, and drives us to consume up to, and past, our ability to pay for that consumption. On top of that, goods are not built to last because that would interfere with profit making. Socialism will be a very different society. Goods will be built to last. The buy-buy-buy advertising industry will no longer exist. People may decide that they have better things to do rather than produce goods that are widely seen to be extravagances. And people may discover that more material goods don’t make them happier. Society already has the knowledge and technology to satisfy all of our basic needs sustainably. There is every reason to believe that socialist society will supply every human being with all the material goods that they need for a comfortable, pleasant, enjoyable life. The environment that is pleasant for human beings is being destroyed because of economic factors inherent in capitalism. At best, with the best intentions of everybody, capitalism can only do too little, too late. Government cannot stop the destruction, it can only slow down the worst of it for a while. If environmental protection rules make production less profitable, then production may move out, the economy will take a nosedive and the environmental rules will be relaxed. How will people who disagree be treated in socialism? Those who disagree will be treated like anyone else. If a person or group decided to start promoting a return to capitalism, or some other class-divided social form, they would be free to do so. If however, a person or group, was damaging society (beating people up, or blowing up buildings, etc.) then society will take appropriate action against them. Freedom must include allowing disagreement with the status quo and spreading unpopular ideas, but freedom does not include hurting people or destroying the common wealth of humanity. Exactly what methods a future socialist society will democratically choose to use, if people need to protect themselves, are beyond the ability of the World Socialist Movement to predict, but one can expect that those methods will be more humane and less dictated by blanket policies than the methods used today. How will problems be handled in socialism? Many of today’s problems, such as poverty, will not even exist in a socialist society. Of course, no human society will ever be without problems. A socialist society will have to deal, democratically and cooperatively, with the problems as they arise. An example of a major problem: even under capitalism, natural disasters generate tremendous volunteer effort and people donate huge amounts of goods, services, and money to help those who are suffering. It is not conceivable that this human response will decrease in socialism. Without the profit constraints of capitalism, such major problems can be dealt with quickly and satisfactorily.